Saharan dust reaching the UK gets in the news quite regularly, usually unfavourably in connection with pollution events. Desert dust is one of several types of minute particles, called aerosols, that are emitted into the atmosphere including salt, carbon and volcanic ash. Human made aerosols, such as CFCs and sulfate aerosols from the burning of fossil fuels, are infamous for destroying the ozone layer and causing climate change but 90% of atmospheric aerosols have natural origins and they all contribute in major ways to the global weather machine. The aerosols constantly floating around in the air that we breathe are made up of a complex mix of particles clumping together in an invisible soup that we are unaware of most of the time. On occasions dust concentration becomes “thick” enough to become visible and reveals itself as haze. Here is some information about desert dust to help get to grips with this impressive weather phenomenon and hopefully clear the air of those mysterious arid particles! This post concentrates mostly on Saharan desert dust but volcanic dust is mentioned as a comparison and is worthy of a separate post at a later date. Dust is naturally lifted into the atmosphere from deserts and is an important component of global weather and climate processes and nutrient transport to ecosystems. Global mineral / desert dust emissions into the atmosphere are estimated to be up to 1500-1800 Tg/year (teragrams) per year and emerge from numerous arid and semi-arid source regions. For comparison, the average global annual volcanic output of ash from average scale small eruptions has been estimated as an average of only 20 Tg/yr (20 million tonnes per year). Less frequent, larger eruptions, inject much more ash into the atmosphere. The Icelandic volcano, Eyjafjallajökull, erupted 250 million tons of volcanic ash during the eruption in 2011. This was still small compared with the largest mega eruptions which blast huge volumes of volcanic dust higher into the atmosphere. Desert dust is usually swept up by winds only as high as the planetary boundary layer 2-4km (PBL), whereas volcanic ash can be injected into the high troposphere or even the stratosphere where it encircles the Earth quickly. Nevertheless, in average conditions desert dust usually dwarfs volcanic ash in the atmosphere, unless there is a colossal eruption. 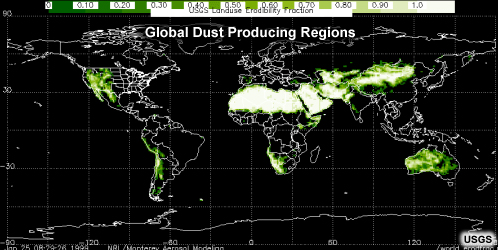 (1 Tg = 1 million tonnes ) and albeit desert dust resides at lower altitudes. The biggest global source of atmospheric dust is the Sahara Desert, a huge area of sand dunes, stone and gravel plateaus, dry valleys and salt plains creating nearly 5 million sq km of potential dust producing terrain. Within the Sahara Desert the Bodele Depression in Chad is thought to contribute half of all Saharan dust. How does dust get into the air? 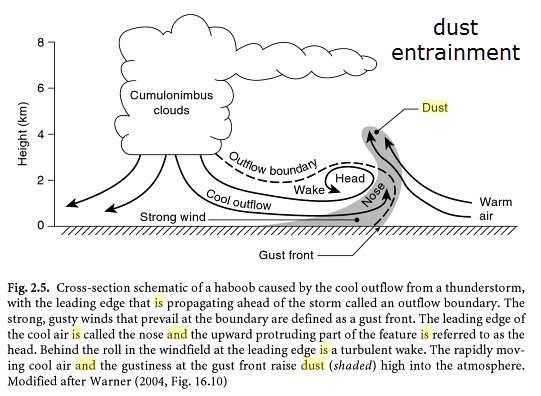 Dust is lifted by strong surface winds produced at different scales, from small local convective processes such as dust devils to meso-scale convective systems such as large thunderstorms through to regional scale frontal depressions. Importantly, rainfall in arid areas contributes to available dust by causing flash floods that wash fine debris into river and lake beds. These rivers and lakes then dry out and provide an important source of desert dust when the wind blows. A good example is the Bodélé Depression in Chad, which is part of the dried out Lake Chad. This area has dust storms on average of 100 days per year and can loft 700,000 tonnes of dust into the atmosphere every day. Meso-scale convective weather systems in deserts can cause strong cold downdrafts of out-flowing evaporatively cooled air descending from cumulonimbus storm clouds that can entrain particles and lift them vertically into powerful upward thermals. Sandstorms known locally as haboobs are created in this way and appear as frightening “Hollywood”style dust fronts in Africa, Australia, China, the USA and recently in the film Interstellar. Dust can also be lifted from the surface by powerful winds covering a large area associated with troughs and fronts sweeping across, or near to, desert regions. 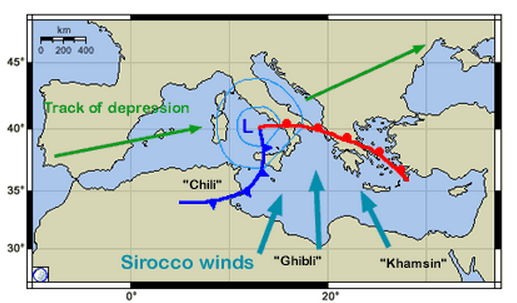 One such wind is called the Sirocco which occurs in eastward tracking Mediterranean lows where the warm sector produces strong southerly winds which can bring dusty conditions into Europe especially in Spring and Autumn. A significant sirocco event occurred 23 March 2016. The event shows up well on a synoptic chart and satellite photo. Various other synoptic scale meteorological scenarios bringing European / UK dust events are discussed below. Once elevated, coarse dust (sand) falls out nearest to the origin but fine dust (clay), less than 0.002mm in diameter, can be lifted high into the troposphere, up to 10km, where it can remain aloft for weeks and be driven thousands of miles across oceans by jetstreams. 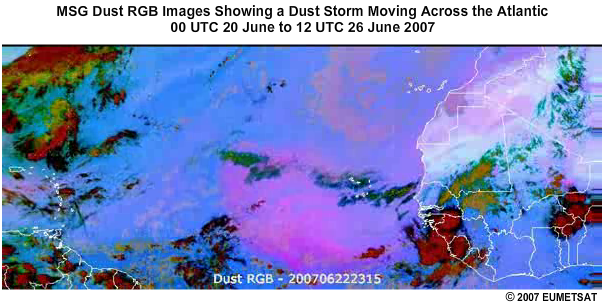 Saharan dust routinely travels to the Caribbean in the summer on an easterly jetstream. Dust is eventually deposited in light winds, usually in anticyclonic high pressure systems, or is washed out in rainfall. In this way some 40 million tons of dust is transported from the Sahara and deposited in the Amazon rainforest every year. There are broadly two types of dust storm. Dust plumes have a streaky linear point pattern of dust emerging from a point source and spreading into a cone. Dust fronts are walls of dust rising on an extensive, frequently curved path. Desertification of environments in China and Africa seem likely to be increasing the area of global dust producing regions and potentially making the planet more dusty. However, it is not certain whether global atmospheric dustiness will increase or decrease due to expected climate change in source regions like North Africa. The world has certainly been more dusty in the past. It is understood that during past glacial periods (last glacial maximum 18,000 years before present) water was locked up in glaciers creating drier conditions particularly in periglacial mid-latitudes. In Europe, China (Yellow River) and the US (Idaho, Washington, Iowa and Mississippi), huge areas of wind-born dust deposited thick aeolian sediments, one of which extends across the North European plain which now forms very fertile soil called loess. Loess has become some of the most productive agricultural terrain in the world. “Dust to dust” seems more apposite than ever considering our reliance on natural dust transport for our food. loess hills, fertile farmland courtesy of dust! What are the impacts of dust on climate and environment? Over long time scales dustiness increases during cold climatic periods (glacials or ice ages). 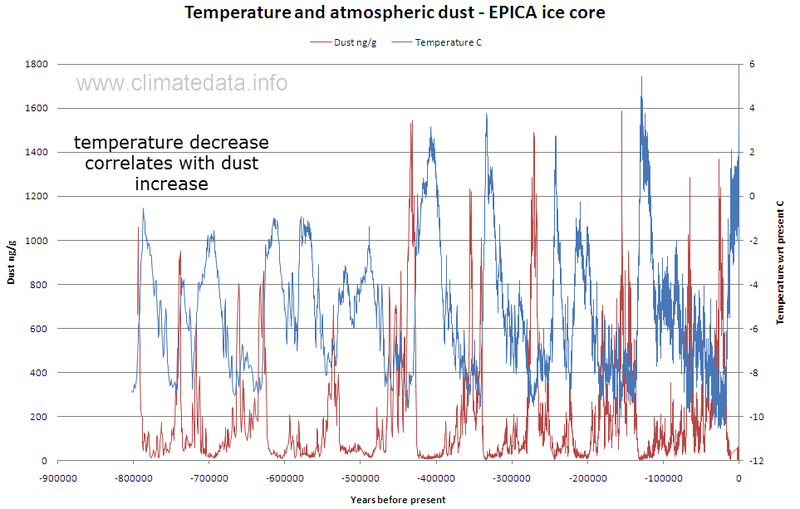 Evidence for this comes from ice cores in Antarctica and Greenland shown below. Over shorter time scales, dust plays various complex and sometimes contradictory roles in atmospheric processes, including modification of solar energy receipt, temperature, cloud formation and influencing rainfall. Dust also has impacts on ecosystems and human activities which can be beneficial or detrimental and even hazardous. So, what can atmospheric dust do exactly? imports important beneficial minerals and nutrients such as nitrates, phosphates, iron, calcium, silicates etc to ecosystems like the Amazon rainforest. 200 million tons of fertilizing dust is transported from Africa to the Amazon each year of which about 40 million tons is deposited directly into the forest ecosystem: this is possibly the main nutrient source for the forest. Marine ecosystems also benefit from dust inputs e.g. stimulating growth of phytoplankton and subsequent food chain. reduces Atlantic hurricane formation: enhanced dust from the Saharan Air Layer (SAL) over the Atlantic during the hurricane season has been correlated with reduced numbers of hurricanes, possibly due to the dust reducing sunshine which suppresses Atlantic sea surface temperatures in the hurricane development zone. The EUMETSAT satellite image below shows a dust veil (pink) killing off convection cells (brown and green) as it moves across the Atlantic towards the Caribbean. 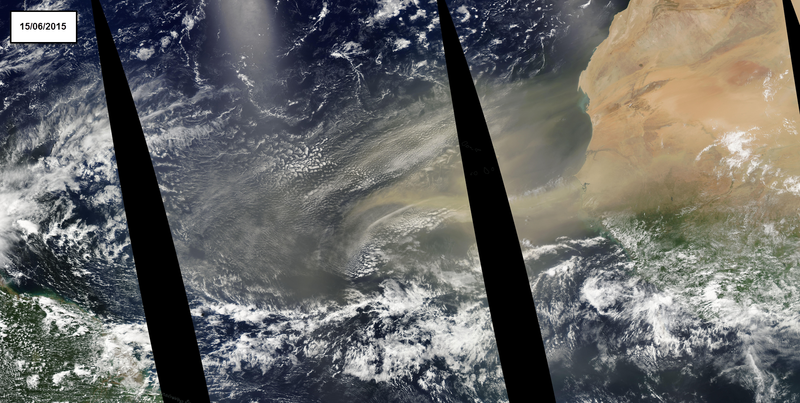 The Saharan Air Layer is a hot, dry and dusty stream of upper air emanating from West Africa, especially during summer. The SAL could also inhibit convection, and hurricane formation, by creating an inversion preventing updrafts necessary to kick-start tropical storms. So, dust is clearly a critical part of the weather machine and can bring both benefits and problems. The next section attempts to explain how desert dust can get all the way to Britain from the Sahara. 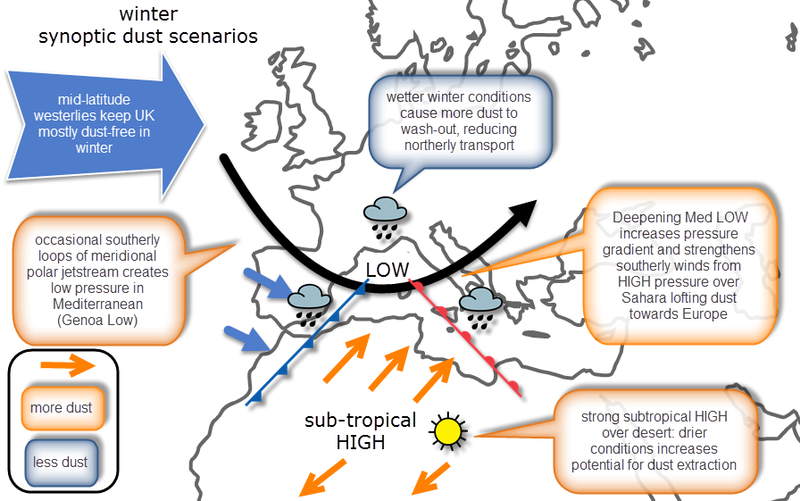 What weather patterns typically bring dust to the UK and Europe? In Winter, the subtropical Saharan HIGH pressure is strong with winds wanting to spill away in all directions, potentially carrying dust. However, with a more southerly jetstream and visits by low pressure systems, the Mediterranean is often unsettled and wet during winter. 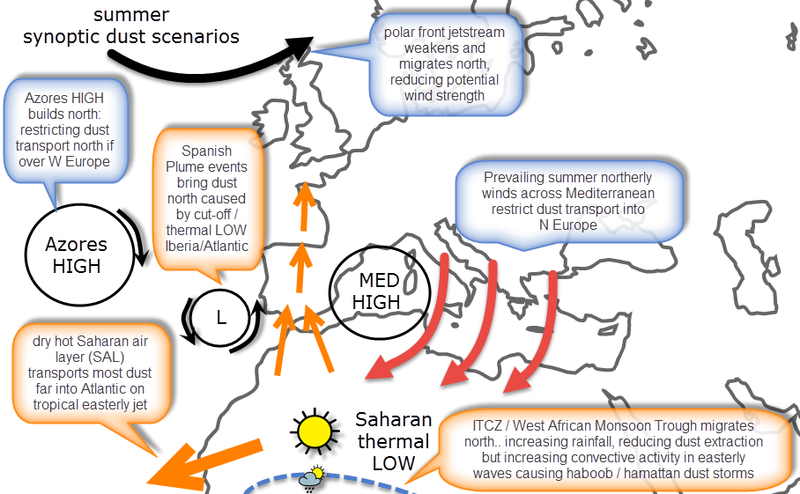 Despite the Sahara being dusty in winter, dust events extending to Europe in winter tend to be restricted because particles are washed-out by winter rainfall before it gets very far north. The transitional seasons of Spring and Autumn can produce the most significant dust episodes in Europe. The desert heats up and dries out creating ideal conditions for dust to be elevated by strong winds. Low pressure can still dip south on meridional jetstreams and create Genoa low pressure which typically increases wind speeds across North Africa. A cooler Mediterranean Sea surface temperature means that less convection occurs and creates less wash out opportunities as any dust travels north. Therefore, springtime is potentially more dusty for Europe given the right conditions. In Summer the Mediterranean HIGH pressure develops as a semi-permanent feature. This inhibits transport of dust from the Sahara. Nevertheless, occasional heat lows over Iberia or cut-off lows can create the right southerly wind on a Spanish Plume to bring dust as far as the UK. Dust events in Europe vary in scale and can occur at any time of year but it seems usually and most effectively in transition seasons, especially Spring. In 1901 an historic dust event created the first recorded “blood rain” across Europe. In this single dust event, well documented, some 50,000 tonnes of dust was deposited across Europe (this would have required a 250km long convoy of 2500 20-tonnes lorries to transport). It has been estimated that dust build up across Europe is 4-5mm per century. Here are some examples of past European dust events showing the synoptic evolution of how dust gets to Europe. Note that meso-scale convective systems (MCS) typically producing dust storms in the Sahara are sub-synoptic and sometimes the dust lofting event barely shows up on these charts. Nevertheless, the synoptic patterns transporting the dust into populated parts of Europe are well illustrated in these examples. So what is the future for dust? There is no certainty on the impact of climate change on the future of dustiness in the atmosphere. 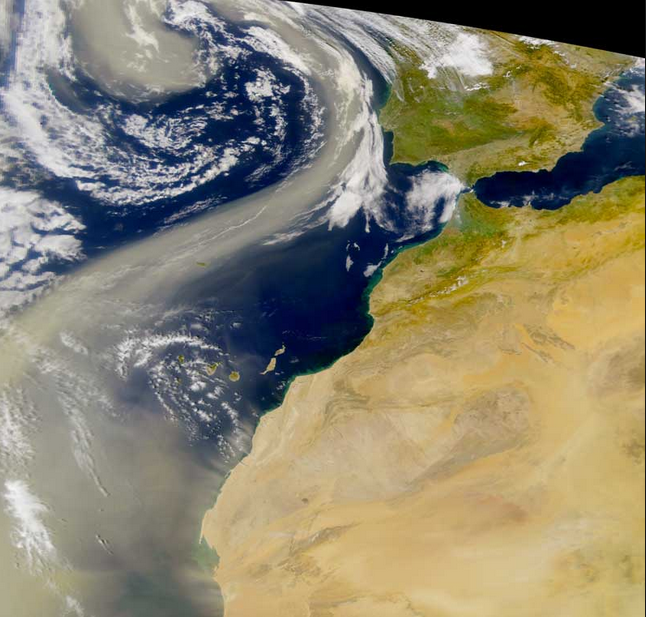 There have been press articles suggest there is increasing Saharan dust emission due to population increase, intensive farming and land degradation in North Africa. “There has been a dramatic increase in some aspects of dust flux [emissions], which have doubled over the last 50 years. Population pressure alone is likely to exacerbate the problem and if current trends continue the amount could double again over the next 50 years,” said Dr Bryant, a Reader in Dryland Processes at the University of Sheffield. Nevertheless, the impact of these activities is not certain and others suggest dust emissions are not increasing. For example, despite human desertification and degradation of semi-arid environments causing increased potential source areas of dust, it appears that the most significant dust source globally, the Sahara desert, has not in fact been perturbed by human activities since the major dust sources are mostly in uninhabited areas and in true-deserts. 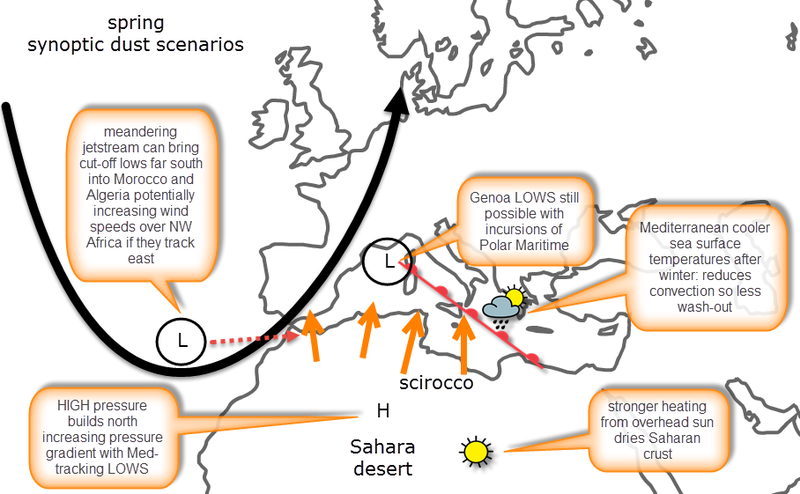 The IPCC predict that North Africa will get drier and therefore presumably more dusty. However, models suggest that specific dust source regions could become wetter. There are significant uncertainties over African dust and climate change and there seems to be no clear correlation over recent decades between measurable climate change and dust load in the atmosphere. Models cannot agree on rainfall changes in North Africa.